We are providing machining facility to various engineering houses surrounding Ahmedabad. We are having CNC Vertical Machining Center with Side Head Operation facility of 3 x 2 x 1 mtr. size. We have in-house CAD/CAM facility also to make operation efficient. 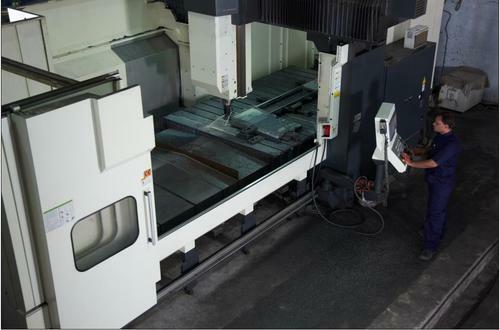 · CNC Machining facility for metal components up to 3 x 2 x 1 mtr. · Upto 5 ton single piece job can be handled . · Tolerances as per drawing can be achieved. Since our inception in 1972, we “Mohansons India” are actively committed towards manufacturing, exporting and supplying a wide range of Paper Cutting Machine and Magic Cut Paper Cutting Machine. We offer our product range under the brand name of “Sudharshan”. These machines are suitable for small to large jobs, simple to complex cutting layout and various kind of paper material from hard board to tissue paper. Well equipped with hydraulic operated clamp, the hydraulic operated knife of these machines ensures the finest cutting performance. Our provided machines are manufactured under the directions of our skilled engineers by using the best in class components and cutting edge technology. Cutting machines provided by us are highly acknowledged among our clients due to their sturdy design, hassle free functioning, energy efficiency, high performance, long service life and low maintenance cost. Quality is main objective of our company therefore we have checked these machines against numerous parameters at our in-house testing unit against numerous parameters. As per the variegated needs of the clients, we provide these machines in numerous models and other technical specifications to choose from. We generally export these machines in Africa, Kenya & Dubai. Besides, we provide these highly efficient machines to our clients at market leading rates within promised time frame.